This recipe happened by accident. 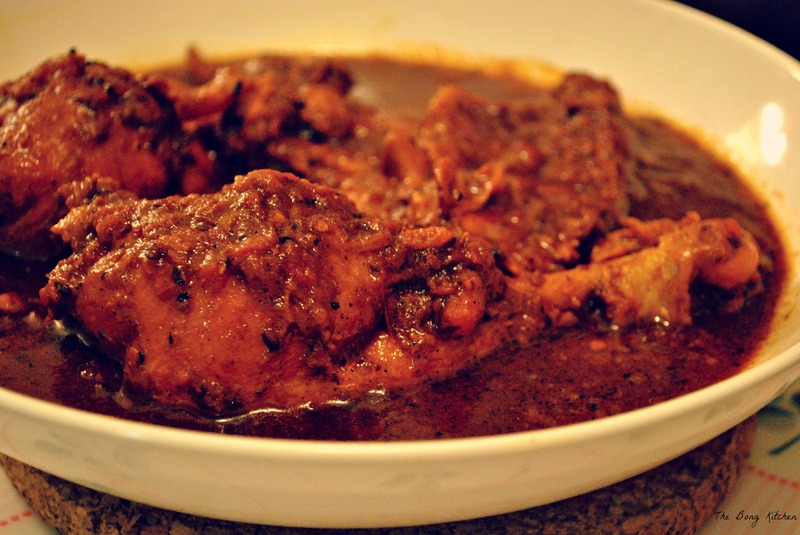 Lately, I have been reading a lot about Goalondo Chicken curry on food forums and how they came into being, not to mention the zillion versions that float over the internet. Few years back I had read this book, Sea of Poppies by Amitav Ghosh where he talks of among st other things, about indentured Labourers from India, particularly from Bihar to the Island of Mareech or present Mauritius. Some where in the book he does mention about their day to day lives and what they ate, how they cooked etc, but I am not very sure whether he goes deep into the recipes or if he does, my memory has failed in recollecting them. 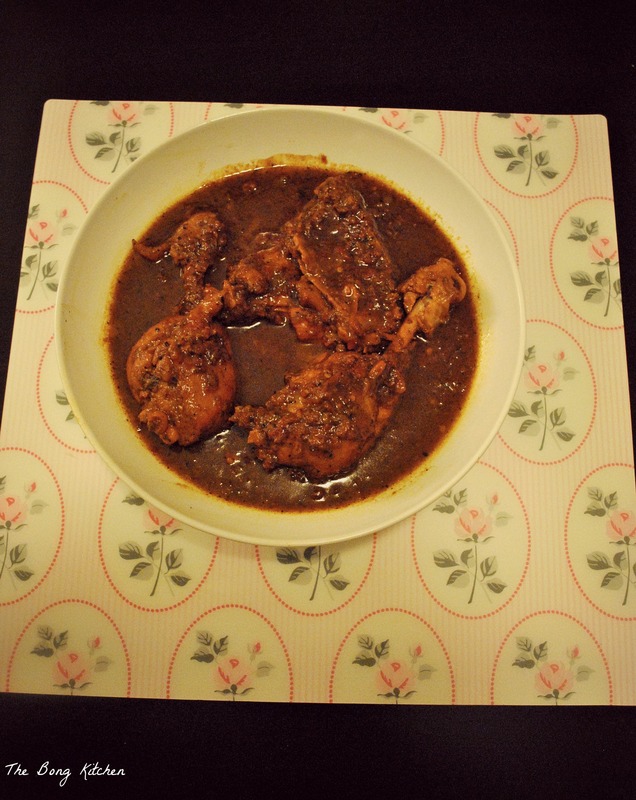 So this recipe is part my invention, part history and of Mauritian cuisine history. Mauritian cuisine is heavily influenced by Creole, Chinese, Indian and European cooking. Mauritius is known to have strong ties with France, therefore dishes like coq-au-vin, bouillon and daube are very popular. During the 19th after the abolition of slavery, Indian workers who migrated to Mauritius brought their cuisine with them. These indentured labourers came from different parts of India, each with their own culinary tradition, depending on the region. They added their two bits into the already existing French cuisine and that is how the Duabe curry was born. The origins of the Duabe can be traced back to Provence where it is known as Duabe de Provence which is beef braised in wine, vegetables, garlic and herbs de Provence, and is traditionally cooked in a daubière, or a braising pan. The French settlers brought this dish to Mauritius. Over the years with the influx of Indian labourers the dish was modified to suit their taste and pallet. Herb de Provence was replaced with their own spice blend and thyme with coriander leaves.and Traditionally, duabe has wine in them but Mauritians do not add wine and since the recipe comes from workers from India, it is cooked with white chicken or any game meat rather than beef. 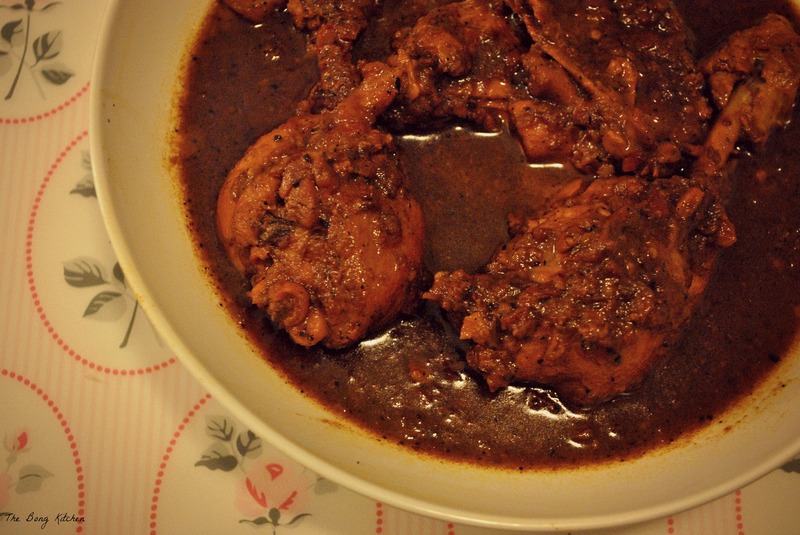 The Mauritians also have a simple Chicken Duabe version as well. This one is modified further to suit the South Asian Pallet. Start by making incisions on the chicken pieces ans marinate the chicken with salt, pepper and lime juice and let it rest for about 30 mins to 45 mins. Next dry roast the spices listed under spice blend and grind them into a fine powder. I personally, use a mortar and pestle because I like the rough blend but the choice is yours. Now heat a heavy bottom pan, ideally a dutch oven or a cookware with a lid. add about 3 tables spoon of the oil and gently fry the chicken pieces. DO not over cook them. Fry long enough to just let the brown spots appear on the chicken. Keep it aside on a plate lined with kitchen towel. Now in the same pan add 2 more tablespoons of oil, once it is hot add the onion and saute till it looses colour and turns golden next add the ginger and garlic and continue to saute till the raw smell disappears. Now add the tomatoes , if using whole tomatoes wait till they mash up and become all pulpy. This takes a while so there is no point in rushing. If you are short of time, you can use canned puree but there will be a difference in taste. Once the tomato is all pulpy add the spice blend along with turmeric( 1/2 teaspoon) and red chili powder, saute till they release the oil. Now add the chicken pieces and mix it well with the spices, this is called sealing the meat. Takes about 10 mins or so. Next add the chicken stock or water an cover the pan, let the chicken cook for about 15-20 min should not take longer than that. Just before serving garnish with coriander leaves and lime juice. It’s nice to see a recipe where I can try something new with ingredients I already have! that looks like something i would enjoy..
That looks really good. I’ve bookmarked and shared. I’ve never heard of this, but it looks SO good! I wonder if I’ll be able to find black cardamom so I can make it. It is like cooking with my OH! This looks easy and really good, thanks for sharing. Oh that looks nice and savory! Thanks for sharing! yummy!